There is never a dull moment in this little ‘Wonder of Asia’. Either there is a radicalised bunch of kids trying to change the world, shouting their throats hoarse and dry, or else, it would be a bunch of know-alls trying to drill some sense or nonsense into the political blockheads but, are driven back by a kaki-clad swarm of lawmen just trying to keep their jobs intact. On Tuesday morning, it just appeared out of thin air. Our Dambulla Correspondent Kanchana Kumara Ariyadasa filed us this unusual story. There was a development alien to its generally laid-back habitat. 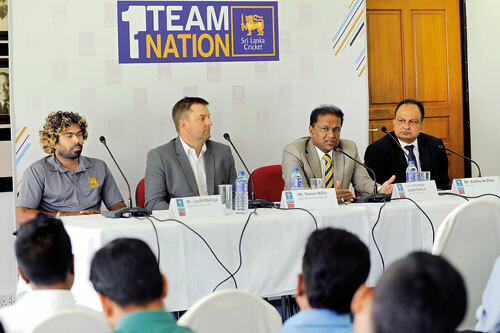 Eleven workers employed by Sri Lanka Cricket (SLC) on a contract basis perched on the Dambulla Stadium rooftop, demanding job security in their terms of employment and saying they were not prepared to get pushed into the proposed Provincial system. The system, a new ruse adopted by the SLC management, was the cause of their apprehension. Our reporter wanted to have a one-on-one with the aggrieved parties, but the SLC authorities had shut him out. By Thursday, the disease had spread and the staff of all international venues were on rooftops. Strongman SLC chief Thilanga Sumathipala responded saying, those employees are being treated well, but he is not ready to be steamrolled by any hidden force wanting to create chaos in the cricket field. But, in reality, are the doings at local cricket’s citadel hunky dory? What we see is that, for every step they take forward, they take two backwards. Sumathipala, on Thursday, was trying to explain that, just because the Lankans lost a few games in South Africa, it does not mean the Lankan side is bad or, it is the end of Sri Lanka’s cricket. Generally, in the corporate world, when the job is done, there is no ‘Thank you” and “Well done”. That is your responsibility, and your job depends upon it. However, if things do go wrong, there would be questions asked and the entire chain of authority is held responsible. Then, we also ask how much could the SLC hierarchy be trusted, and whether they are doing the right thing. In short, when things go wrong, does the buck stop with them? Recently, at a media conference, the question why the authorities did away with the ‘selector on tour’ arrangement, was discussed in detail. This was because a selector joining the team has been a practice for the past several years. We are all aware of that thorny issue. Then, not even 48 hours later, when the second T-20 was on, all of Sri Lanka saw Selection Committee Chairman Sanath Jayasuriya marshalling his troops in Proteas-land. This development was tantamount to SLC hoodwinking the media and the public. A breach of confidence of this nature should be taken very seriously because, once the Fouth Estate senses someone is fibbing, the repercussions are unpredictable. Nevertheless, on day one of Jayasuriya’s arrival in South Africa, the Lankans won a match, and there was he in all his glory. But, since then, things have gone horribly wrong, with reports about selection committee chairman wanting to tender his resignation in the grapevine. Sumathipala tried to pooh-pooh the reports, saying there were rumours of Sanath trying to tender his resignation even before. But, it is said the such reports surfaced because of interference in selection matters by Thilanga and company, and even now, the complaint persists. Yet, with what transpired on Thursday, one could sense that there is a huge rift between the SLC hierarchy and the selection people. The result: There is an “A” team engagement. A media conference was held with regard to that, but, no one could name the captain of the Sri Lanka ‘A’ team. Last week a much failed T-20 squad was named for the Australian tour, but, players like Jeewan Mendis and Tissara Perera are in the wilderness in spite of the duo being featured regularly in the international T-20 circuit.Yet, on Thursday around 8 p.m. Jayasuriya upon his arrival was hauled up for and emergency session for about thirty minutes. Unconfirmed reports say that the issue was patched up for the time being. Just a while ago the first T-20 rubber on African soil came in this manner. The Proteas won the first game easily. The second game was won almost singlehandedly by skipper Angelo Mathews, in spite of an injured leg, which incidentally, put him out of the rest of the tour and the once again the Australian tour too. Then, in the absence of Mathews, Dinesh Chandimal led the young Lankan team and came in for a lot of accolades from cricket pundits for the manner in which he led the side. But, that was the last time he captained the side. A few hours later, he learned that Upul Tharanga had been appointed captain of the ODI outfit. Remember, in 2014, while Dinesh Chandimal was appointed captain of the T-20 side, there was so much external pressure that, Chandimal underwent a slump in his form and lost his place in the side. Then, sometime later, under different circumstances, he came back to his usual self and began to score. Then came the angel of darkness haunting him again. Now, once again, Chandimal is on the sidelines. On Thursday, SLC broke the news that Lasith Malinga is ready to reappear with the Lion crest. There he made no bones. He said that, if he is offered the captaincy, he is ready to be of service to his country and cricket. Anyway it is not a secret that there is no love lost between Malinga and Chandimal. We feel there are interested parties who do not want either Mathews to be captain or, Chandimal to be vice captain of the national side. Now the stage is being set for the sequel scenario to follow, and the real actors will be unveiled when the Bangladesh series is on show. Then, it could be a different team altogether, with a new agenda, making it easy for the hierarchy to continue with their puppetry without much hassle. Yes, now the game of cricket is getting more and more complicated. The faster you run to cap your target, the more you fall behind in line. PS: Hard hitting Kusal Janith Perera who is a limited overs specialist continues to be ignored. Is it his batting or something more than cricket?